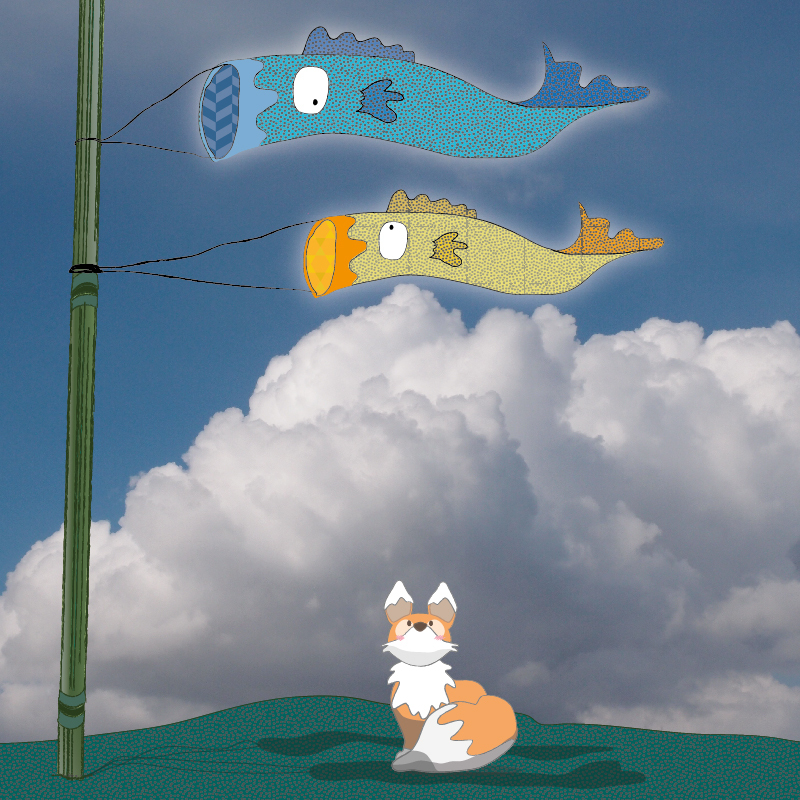 Here is Kiku watching the two carp streamers, known as koinobori, that Boss Panda made for him and Miko-chan – he is finding it a very relaxing sight, and enjoys the sound of the fabric flapping in the breeze. Boss Panda explained to them earlier that today is Children’s Day in Japan – Kodomo no Hi (こどもの日). Once called Tango no Sekku (端午の節句), the event was celebrated as ‘boy’s day’ or the ‘festival of banners’ and celebrated male children and the males of the family. When Japan switched to the Gregorian calendar, the date moved from the 5th day of the 5th month in the lunar calendar to the 5th May, and has been updated in modern times to celebrate all children and the family in general. Carp flags/ streamers are flown from lines and poles to celebrate and pray for the strength and success of children in the family, after the Chinese legend of a carp that saw upstream to become a dragon. They can be hung to represent a family – a black carp for the father (magoi), a red carp for the mother (higoi) and smaller ones for the children. They range from giant flags flown high above rivers and buildings, to mini versions for the modern home. Other cute carp items are often to be found. Other things connected to the day are ‘kashiwamochi’, rice cakes filled with sweet bean paste and wrapped in oak leaves, and people take baths scattered with sweet flag iris leaves and roots, to ward off evil and promote health.